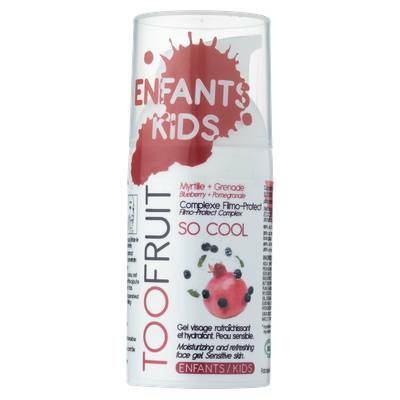 A light gel-cream to hydrate and soothe children's skin. Ideal for a light hydration during the early teenage years or warm seasons. Pomegranate, a natural antioxidant, helps to prevent acne. Blackberry, rich in water, contributes to hydrate the skin and help it find suppleness, softness and radiance. Menthol extracts provide a refreshing effect on the skin. The Filmo-Protect Complex protects the skin from dryness. After cleansing my face with Douce Mousse, I dry it and I press once the pump of So Cool. I spread it all over the face and I massage it to penetrate. Reinforced with water, the skin is replenished. The skin is soft, soothed and refreshed.